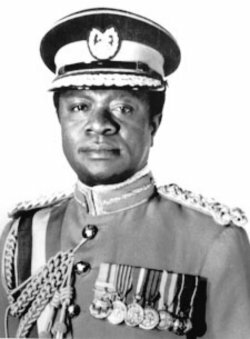 On this date in 1979, former Ghanaian military strongman Ignatius Kutu Acheampong was shot in the aftermath of Jerry Rawlings’ successful coup d’etat. Acheampong had executed a coup of his own in 1972 and run the unsteady West African state for most of the 1970s — a period of economic and political crisis — until he himself was toppled by another General, Fred Akuffo. Acheampong was retired to his home village by the new regime, but he would not enjoy such satisfactory treatment when a national revolution ended Akuffo’s reign and brought junior officer Jerry Rawlings to power. Less than two weeks after Rawlings was installed as Ghana’s new head of state, Acheampong was executed on a charge of corruption. This would not sate the considerable popular anger at the outgoing military clique, which went on to gorge itself on Akuffo and five others later that same month. Former NFL defensive back Charlie Peprah is Acheampong’s grandson.